I've finished my first training block and it's now recovery time. I've been feeling a little run down over the past week and had quite a bit of soreness so recovery is coming at the right time. I wish all recovery weeks started with a day off like I had today. I slept in, did my strength workout, went shopping for sports nutrition, had a massage, and have been lying about on the couch ever since. In fact I will be taking my recovery so seriously that I am skipping tonight's Master's swim since I'm really struggling to keep my blood sugar up today. Even if I got in the pool this evening I would likely have to get out of the pool early. 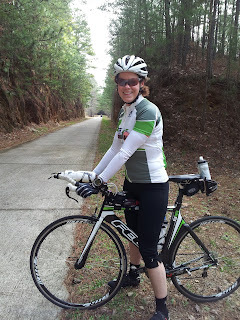 Despite the ominous rain forecast for Saturday we ended up with turned out to be a beautiful day for an easy-ish 50 miles on the Silver Comet. Monika and I felt a little guilty doing the pancake flat Comet trail but after working so hard the past two weeks we figured we had earned a little bit of a break. We still pushed it a little but mostly just enjoyed the trail and fairly warm weather. 25 miles - time to turn around and head back. 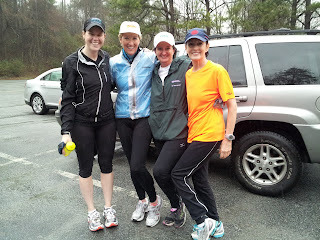 Sunday's plan called for a 10 mile run but my usual training partner, Sarah, was out of town. Further complicating the plan was the arrival of that rain that had been promised for Saturday. Regardless I had to get my miles in and was lucky to have Cristin meet me for part of my run. As we ran down Columns drive Betty drove by and we were able to pick her up about 1.5 miles into our run. This turned out to be a perfect plan for me as it gave me some varying tempo work. It rained and we were soaked to the bone but that was one of the easiest long runs I have ever done and we ended up with a little over 11 miles - excellent! At the end we ran into Anne and Mary Beth who were just about to start their run. What a dedicated group of athletes - rain or not - you gotta get it done. Me. Anne, Mary Beth, and Betty. Soaked! Hi there Susan. How do you like your pump? Thinking hard about it but a bit nerveous..
David - love mine. I knew I wanted one even before I had the surgery and was looking at brochures from my endo as part if my surgery prep. I only did injections for 6 mos. Shots really are easier to manage in a lot of ways but I couldn't do corrections effectively when my BS was under 200 cause 1 unit would send me too low. I love being able to micro adjust to .10 units and can even do a micro correction at 120. I use the Omnipod cause I don't like tubing but I hear medtronic can adjust to .05 units which would be useful for my overnight basal rate. Last a1c was 6.5 and I think it's definitely due to my pump and CGM. Great pic on Silver Comet. I'm wondering who took that picture :) Can you send me mine? I want to post it on my blog also.